We believe that human beings come into the world ready and eager to connect with each other, and that friendship is as essential as food and air for young children to thrive. We also know how hard it can be to give up territory or control in order to collaborate. 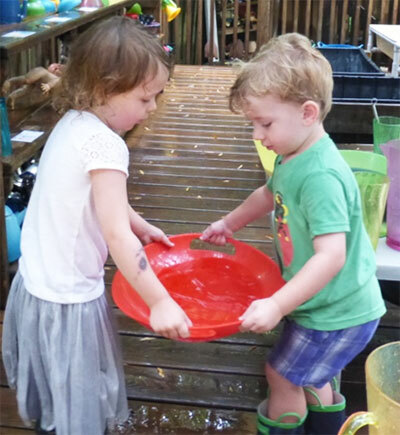 Our task is to create as many satisfying opportunities as possible for kids to work together, so that they are continually encouraged to practice collaboration. We provide equipment that encourages working together. 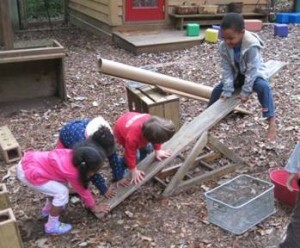 Some things we offer only work when kids cooperate; most things we offer are more fun when kids work together; and almost everything we provide CAN be used together. In fact, we’ve taken some traditionally solitary spaces like tricycles and paint easels and made them big enough for two or more. 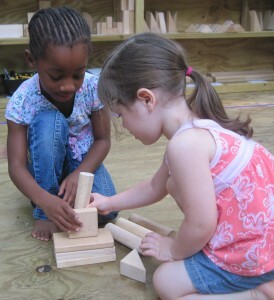 We structure opportunities for kids to work together. We make clean-up tasks “partner jobs” and plan many complex projects — like cooking Stone Soup or producing plays or building a huge robot out of boxes — that require collaboration. 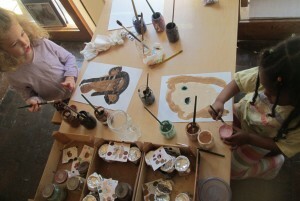 Children Firsters create many self-portraits, but they also paint and draw portraits of their friends. 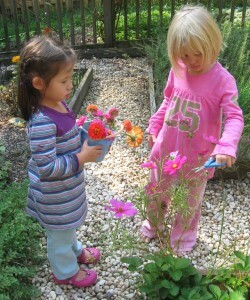 We urge kids to use each other as helpers, consultants and coaches. When a child asks us for help, we often send them to a capable friend instead of helping them ourselves. What’s fun to do with friends? Like one thing that helps is sometimes just try to make the game together, and then it can be funner.